And the Star Wars marketing juggernaut just keeps rolling right along. 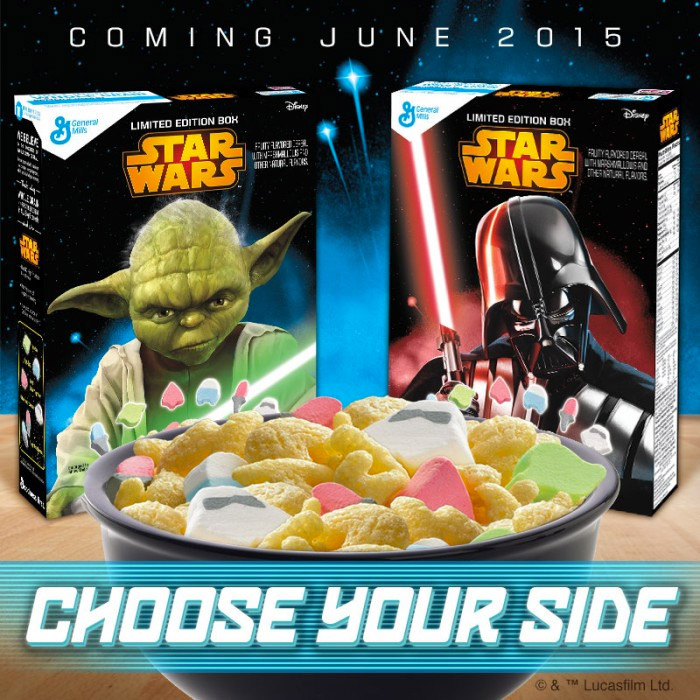 General Mills has announced on their blog – with the catchy headline, “Ready to bring The Force to your breakfast table?” – that in June they will be stocking store shelves with two new breakfast cereals inspired by the sci-fi film series. The collectible boxes will feature opposite sides of The Force – one with Yoda on the box cover and one with Darth Vader. What will you find inside? The company describes the breakfast treat as filled with “fruity flavored shapes ships, lightsabers, Yoda, R2-D2 and stormtroopers.” (Too bad the lightsabers look like an ice cream cone for a 2-year-old.) Two other, as-yet-unannounced charters will grace the covers of boxes to be released in October, and another pair will come out in February of 2016. And if a Star Wars/cereal collaboration rings a bell, you are correct. In 2002, General Mills introduced the limited edition Star Wars Episode II Clone Crunch to commemorate that movie. Back in 1984, they made C-3POs. Hey, breakfast is the most important meal of the day, even for a Jedi.